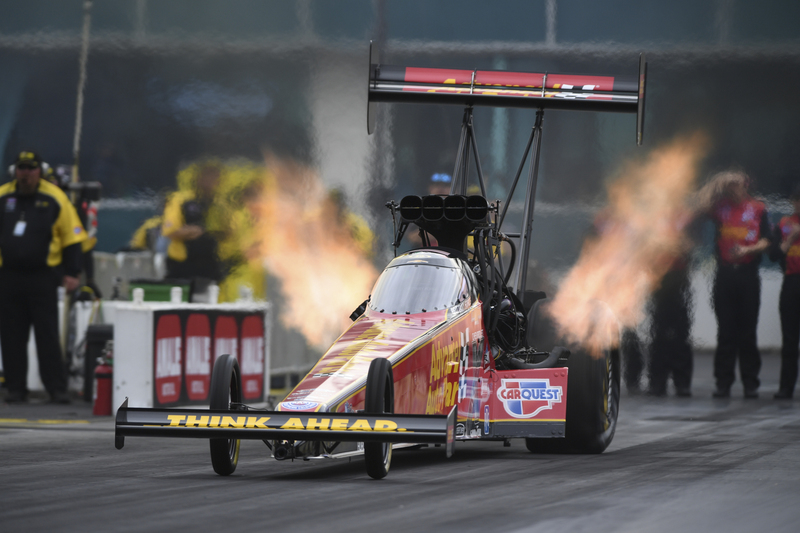 Force locked-in the top spot with her pass of 3.680-seconds at 326.32 mph in her Advance Auto Parts dragster to set claim the track record. The 2017 world champion is seeking her first win of the season at the facility where she secured her first career win in 2016. Force will line up against Chris Karamesines in round one of eliminations on Sunday. Mike Salinas secured the No. 2 spot with his run of 3.694 at 326.32 and will face rookie Jordan Vandergriff. Defending world champion Steve Torrence rounds out the top three. Top Fuel — 1. Brittany Force, 3.680 seconds, 326.32 mph vs. 16. Chris Karamesines, 4.048, 251.63; 2. Mike Salinas, 3.694, 326.32 vs. 15. Jordan Vandergriff, 3.846, 293.09; 3. Steve Torrence, 3.709, 329.75 vs. 14. Dom Lagana, 3.822, 298.40; 4. Leah Pritchett, 3.724, 325.22 vs. 13. Pat Dakin, 3.803, 326.24; 5. Antron Brown, 3.726, 330.23 vs. 12. Richie Crampton, 3.777, 322.65; 6. Terry McMillen, 3.743, 327.74 vs. 11. Doug Kalitta, 3.760, 321.35; 7. Clay Millican, 3.744, 325.85 vs. 10. 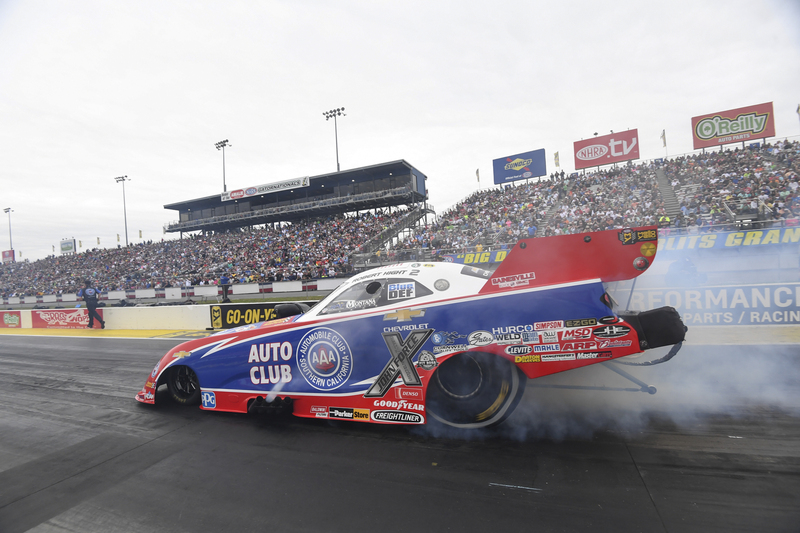 Austin Prock, 3.758, 330.15; 8. Scott Palmer, 3.750, 326.56 vs. 9. T.J. Zizzo, 3.753, 328.62. Did Not Qualify: 17. Cameron Ferre, 4.084, 279.79; 18. Lex Joon, 5.001, 149.78. Pro Stock — 1. Rodger Brogdon, Chevy Camaro, 6.490, 212.43 vs. 16. Wally Stroupe, Camaro, 6.675, 206.67; 2. Greg Anderson, Camaro, 6.494, 213.40 vs. 15. Alan Prusiensky, Dodge Dart, 6.644, 208.36; 3. Matt Hartford, Camaro, 6.508, 211.06 vs. 14. Shane Tucker, Camaro, 6.620, 206.04; 4. Deric Kramer, Camaro, 6.509, 212.36 vs. 13. Val Smeland, Camaro, 6.571, 211.03; 5. Bo Butner, Camaro, 6.511, 212.09 vs. 12. Fernando Cuadra, Camaro, 6.542, 212.13; 6. Jeg Coughlin, Camaro, 6.514, 211.89 vs. 11. Kenny Delco, Camaro, 6.538, 211.89; 7. Alex Laughlin, Camaro, 6.515, 211.99 vs. 10. Jason Line, Camaro, 6.534, 211.79; 8. Chris McGaha, Camaro, 6.516, 211.96 vs. 9. Erica Enders, Camaro, 6.518, 211.13. Did Not Qualify: 17. Jeff Isbell, 6.683, 207.37. Pro Stock Motorcycle — 1. 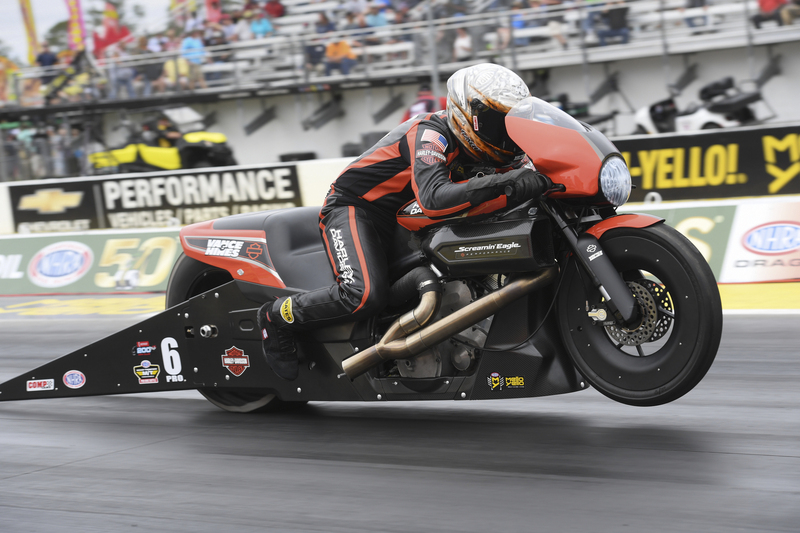 Andrew Hines, Harley-Davidson, 6.720, 199.67 vs. 16. Cory Reed, EBR, 6.918, 195.03; 2. Eddie Krawiec, Harley-Davidson, 6.747, 200.59 vs. 15. Scotty Pollacheck, EBR, 6.893, 193.35; 3. Matt Smith, EBR, 6.753, 200.95 vs. 14. Angie Smith, EBR, 6.888, 197.28; 4. 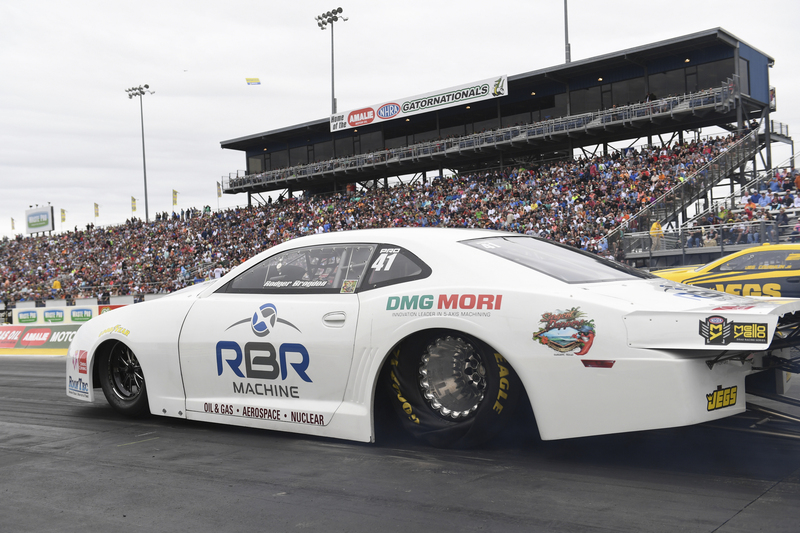 Hector Arana Jr, EBR, 6.784, 199.02 vs. 13. Kelly Clontz, Suzuki, 6.874, 193.07; 5. Ryan Oehler, Buell, 6.803, 199.91 vs. 12. Karen Stoffer, Suzuki, 6.869, 195.08; 6. Angelle Sampey, Harley-Davidson, 6.814, 195.90 vs. 11. Joey Gladstone, EBR, 6.855, 193.07; 7. Jim Underdahl, Suzuki, 6.821, 197.16 vs. 10. Melissa Surber, Buell, 6.850, 193.46; 8. Jerry Savoie, Suzuki, 6.844, 193.85 vs. 9. Hector Arana, EBR, 6.847, 198.20. Did Not Qualify: 17. Steve Johnson, 6.938, 194.24; 18. John Hall, 6.949, 193.49; 19. Katie Sullivan, 6.959, 193.10; 20. Marc Ingwersen, 6.960, 192.47; 21. Jianna Salinas, 7.092, 191.46; 22. Lance Bonham, 7.101, 187.16; 23. Andie Rawlings, 7.256, 179.54.